GUYS. I LOVE WRITING THIS SERIES. I'm not ashamed to admit that your girl is a naturally curious soul and I looove hearing about the lives of the talented makers, businesswomen and creatives I've come across while writing this blog. Thus my A Day With series was born, AKA a way to legitimise my curious ways... This month I was lucky enough to quiz the owner of my favourite Northampton café and bar, Nicola of The Artist Table. 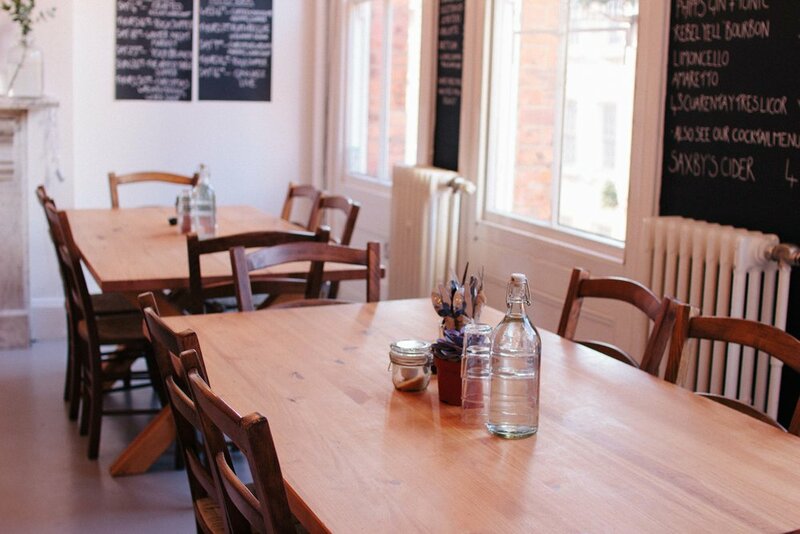 Originally a regular supper that collected together creative souls from across Northamptonshire, Nicola opened the doors of her beautiful eatery in the early summer of 2017. Her food is incredible and I loved getting to know more about her and her love for food... Enjoy! Where did the idea for The Artist Table come from? Artist Table name was conceived by bringing my two passions together. I originally trained in fashion and textiles and worked as an artist for many years but have always had a love for food and how it brings people together around a table. After having my son I wanted to simplify my life by bringing the things that I most enjoyed together under one umbrella so to speak. It made sense to me that ‘artist’ and ‘table’ would feature somehow. After a few different variations this is the one that stuck and held resonance and meaning for me. What does a typical day at The Artist Table look like? So my day begins usually with the food prep for lunch that day. I like to make everything as fresh as possible so once the food orders have come in I hatch a plan for the menu and take it from there. We open at 11 and people start coming in for lunch from anytime thereafter. I work with the lovely Amy who keeps everything going front of house whilst I go between the cafe and the kitchen. Where possible we try to use local suppliers, ingredients or products from local businesses and we have found that this is something that people enjoy. We get our coffee from Yellow Bourbon, locally brewed beers and fins from Phipps NBC & Maule Brewing, our bread from The Good Loaf and our deli meats come from the Italian Shop in Abington. Local and lovely all the way! The day tends to ease of by late afternoon and I take that opportunity to plan any upcoming workshops, events, menus or general cafe happenings that I need to let folks know about. From there it is general tidying up and restocking ahead of the next cafe day. On paper it sounds very straight forward but my brief description doesn’t really do any justice to the amazing people that we meet on a day to day basis from such a diverse set of backgrounds. This is the part I love. Feeding people, meeting people and creating space that they feel at home in for the time they spend with us. Your food is amazing; where does your passion for food come from? Thank you Anna...that means a lot! My passion for food definitely comes from my mom who trained as a chef when we were very small but, owing to having young children at home and the schedule that chef life required, she was unable to fully pursue her passions and chose instead to spend time with us at home. Now I have my own son and I am pursuing my own goals I really appreciate what she did for us and that really motivates me to keep on pushing. How do you go about getting inspiration for menu ideas? I am a total cookbook junkie. I love any excuse to buy new one. I’m not a person that cooks loads of recipes from each book but I use them for inspiration with flavour or ingredient combinations. I also enjoy traveling and our experiences abroad can also inspire new menus and ideas. What's the most rewarding aspect of owning and running The Artist Table? One of the most rewarding aspects for me is being able to create a space that allows people freedom to gather and create community through the different type of events that we offer. Having the opportunity to meet people from all walks of life and hear their stories whilst they eat and enjoy food I have prepared for them is a real buzz. I love that the space that has been created permits all these things and that I can be part of it all. I think for me it is trying to balance my home life with running my own business. The nature of the business means that I am often both physically and mentally tired, which in and of itself is to be expected but as a mama of a 3 nearly 4 year little guy my time is not my own and creating balance between these two worlds can be challenging indeed. I know you host lots of workshops; is there anything coming up that you're really looking forward to? I am just in the throes of planning our offering for 2018. We will be having a wellness weekend at the end of January and I’m super excited to be hosting more yoga brunches with the lovely Ali Yoga, an Artist Table Supper in February. There are some fab workshops that are we working out the details for and many many more exciting things to come. I update all of our events on Insta and FB so keep an eye and I will do my vey best keep you in the loop. And there you have it! My thanks to the wonderful Nicola for letting me interview her; if you find yourself in Northampton, you have to give her gorgeous space a visit; it is truly something special!